Introducing one layer at the bottom of a hairstyle removes excess bulk in this area, causing the hair to flip upward. The flip will be subtle when only one layer is cut into the style, making this cut more suited for those with fine- to medium-textured hair. When styling a flip hairstyle, use a large, round brush when blow-drying the hair, and bend the ends upward while holding the nozzle of the blow dryer underneath the brush. To further set the flip, use a flat iron or large-barreled curling iron to help the ends of your hair flip up. Wash the hair to remove any styling products. Condition, rinse and comb the hair with a wide-toothed comb to remove any tangles. Part the hair from the middle of the forehead to the middle of the nape of the neck, creating two even sections. Part the hair again from the top of the head to the top of each ear, creating two more sections and four sections in total. Use hair clips to separate each section. Cut the length of the hair to between chin length and shoulder length, depending on your preference. Begin by taking a 1-inch-wide horizontal section from the bottom of each back section, pinning the rest up and out of the way. Cut this 1-inch section to the desired length. Repeat this process, using the previously cut hair as a guide, until all the hair in the back is the proper length. Cut the side sections to match the back's length. Cutting 1-inch, horizontal sections at a time, as with the back of the head, cut each side of the hair to the same length. Section off both side sections again, keeping the back one large section. Secure each side section with hair clips. Section off a 1-inch-wide section of hair that runs from the top of the head, straight down to the nape. 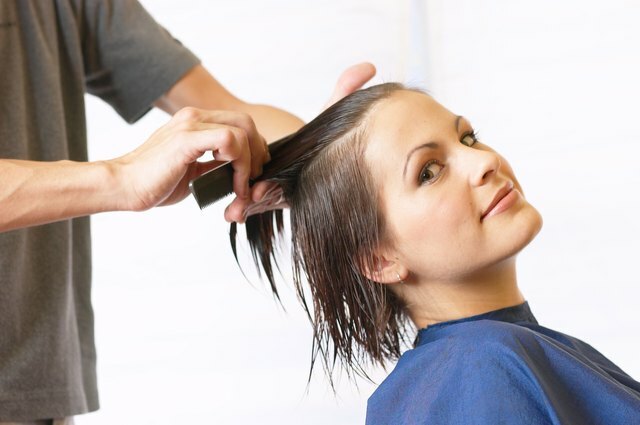 Comb this section of hair and pull it away from the head at a 90-degree angle, grasping the section of hair between the index and middle finger. Glide your fingers along the length of the 1-inch section of hair until only one-fourth of an inch of the hair's bottom length protrudes above your fingers. 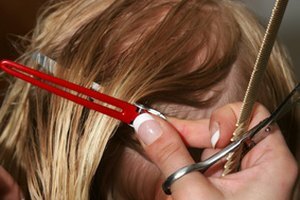 Using the bottom length of the hair as a guide, making sure not to cut the guide any shorter, trim the excess hair above the guide to the same length. Repeat steps 6 and 7, 1-inch sections at a time, all through the back section of the hair. To check for evenness throughout the back section, comb the hair straight down and then lift it at a 45-degree angle away from the nape of the neck. Any uneven layers can be trimmed to match, making sure not to cut the bottom guide length. Unpin one of the side sections and comb it straight down. Section off a 1-inch-wide vertical section where the side and back sections meet. 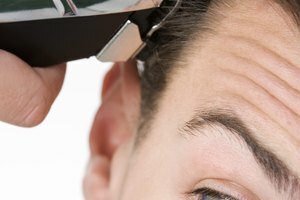 Grasp the section with the index and middle finger, sliding the fingers down the section as before, and trim any excess hair above the guide. Repeat this process for both this side section and the other side section. Check for evenness of each side section in the same manner as you did for the back section. To encourage hard-to-curl hair to flip, set the ends in Velcro or hot rollers, rolling the last 2 to 3 inches of hair upward. Naturally curly hair does not suit a flip hairstyle. The natural curl will fight the flip action and not hold the style.